To support comprehensive analysis of a genome/exome from one sample, SPRI paramagnetic bead-based technology enables rapid and highly efficient extraction of RNA and genomic, plasmid and mitochondrial DNA. This extraction technique is easy to execute, and suitable for manual processing in low-throughput environments, as well as for fully automated, high-throughput applications. The FormaPure XL Total extraction and purification kit uses SPRI technology to isolate RNA and DNA from formalin-fixed, paraffin-embedded (FFPE) tissue, without the use of xylene. To minimize the risk of losing critical genetic information, this kit has been demonstrated to maximize sample integrity, yield and purity from FFPE of 4 different tissue types. Contact our genomics proof of principle support if you don't see your sample type. 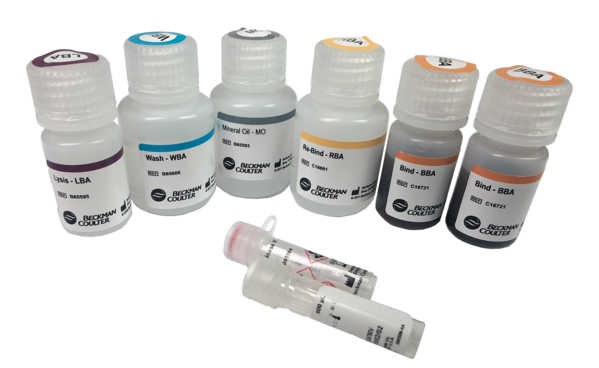 FormaPure XL Total by Beckman Coulter is a single-chemistry extraction kit to isolate total nucleic acid (RNA and DNA) from FFPE tissues.